GoLite, a manufacture of outdoor equipment, is offering a once in a lifetime giveaway. 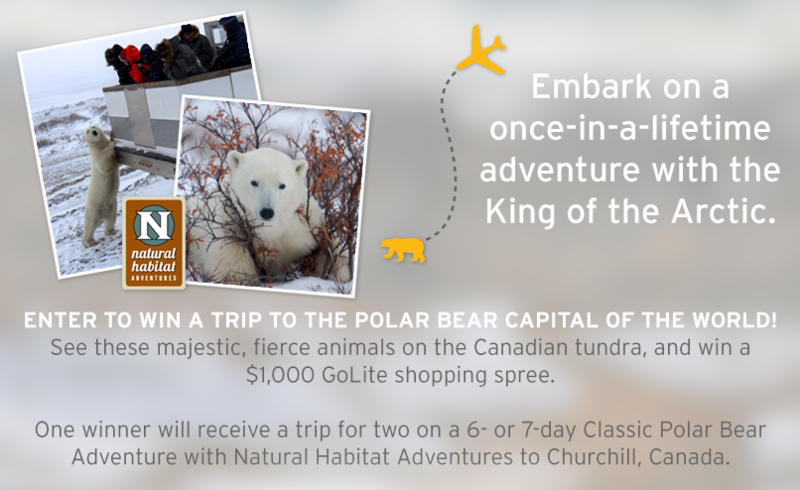 One lucky winner will receive a trip for two on a 7 day polar bear adventure in Churchill, Canada. In addition to this amazing trip, the winner will also receive a one thousand dollar GoLite shopping spree. I am such a nature junky, this giveaway would be a dream come true. It’s also one of those experiences that global warming will soon render impossible. The only downside of this giveaway is the fact that you have to enter with your Facebook page. I assume this won’t matter to 90%+ of all potential entrants. I am still a little reluctant to share such details for just a chance to win. Come on, they could give me at least a $20 off coupon to sell out my Facebook friends. I’m cheap, but I still have some semblance of standards. If you have a rule oriented mindset concerning giveaways, check out this page for full details. The appearance is very reminiscent of 1995. Maybe that is an indication of how many people actually read the rules during these giveaways. GoLite is a seller of outdoor sporting goods equipment. The store was founded in 1994 by Kim and Demetri Coupounas. The Coupounas are avid explorers in their own right, having traversed all fifty states and a wide variety of countries to boot. These experiences helped them recognize the need for ultimate utility at the lightest weight possible. This need was to become the foundation and driving force of the GoLite store. Over the years, GoLite has expanded to have more than 17 brick and mortar locations spread across the Western United States. They’ve also built a thriving web presence in recent years with a stock of hundreds of products frequently priced 40% or more under the nearest competitor. The selection isn’t as abundant as you might find from some of their competitors. This is indicative of GoLite’s founding desire to only sell the highest quality products intended to withstand the elements at the lightest weight possible. If you want to check out their product, you can click here. The link to enter the ultimate polar bear vacation getaway and $1000 shopping spree is here.